All new parents know they need to prepare to bring baby home. The best way to feel comfortable and confident you have a safe home for baby is to stock up on some essential babyproofing supplies; however, the world of baby products is vast and can get confusing quickly! Not to worry; we have some parenting advice on how to find the best babyproofing supplies. Before you head to the store and pile your cart with items you may never use, take a minute to do some research. By hunting online beforehand, you can determine which items you need and which brand would be best for your individual home and budget. Researching items can also help you discover additional items you wouldn’t have considered purchasing on your own and lead you to an even safer environment for your child! One of the best ways to find great baby supplies is surveying your friends and family who are parents themselves! They know firsthand which products worked well and which did not. They can paint an accurate picture of what places in your home you should prioritize, and even point out some items you may have overlooked. With this intel, you can hit the store with confidence knowing that you’re purchasing baby proofing supplies that will keep your little one safe. When your baby arrives and you inevitably must head to the store to purchase an item you forgot, make sure you are shopping safely with your infant. There are stores that have specially designed shopping carts to keep your infant safe and secure while you shop. Take a look to see if your favorite retailer has a Safe-Dock. 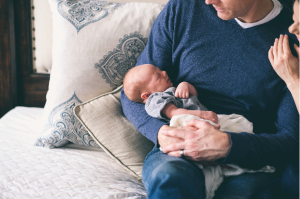 Finding the best babyproofing supplies will give you peace of mind when your baby arrives, knowing you’ve surrounded your little one with items to keep them safe. By taking these simple steps, your babyproofing experience will be that much more enjoyable!